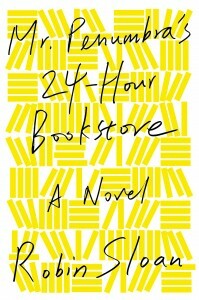 Mr. Penumbra’s 24-hour Bookstore by Robin Sloan has made my list of books I’ll always remember. As a person who believes nothing happen by accident, this is “the right book exactly, at exactly the right time”. As if Robin had written this book for me. I went to art school; I do graphic and web design; I hack code to appease the Google engine god; I love old books; I admire type designers; I live in harmony with the old and the new. Clay, the hero, bumped into his new job at a mysterious bookstore. I mysterious fell into the writing world, which requires me to read a lot, which led me to this book. Just when I question if there is a place for my current project, a sci-fi, fantasy, clean story set in the near future, this book landed in my hands. This is the prefect example of a writer putting everything he ever learned into his writing and fusing only the necessary elements to create an enchanted world. A fest I hope to conquer as well. It’s incredible how you managed to weave an old fashion quest in with the technologies of today. And it felt like that is the way it’s suppose to be all along. I’ll always remember Mr. Penumbra’s 24-hour Bookstore because with a few more brain cells and a few less years, I might have been the night clark at the tall and narrow bookstore. This entry was posted in I Read This and tagged adventure fiction, Books I'll Always Remember, Robin Sloan, sci-fi fiction by n2n. Bookmark the permalink.